One of the most common dynamics I witness in relationships is the playing out of the Drama Triangle. Even the most enlightened of us do this from time to time, so it’s an important concept to understand. 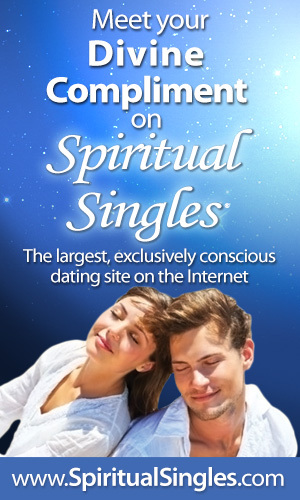 Say your partner expresses a problem they’re dealing with. You, naturally, want to come to their rescue, so you offer a suggestion. They start to resist and give you excuses why your suggestion won’t work. You are convinced your suggestion will work, and keep trying to make them understand how they can implement it. Or you start offering other suggestions, which they also dismiss. You don’t understand why they’re not willing to take your help. They stand their ground and get defensive, insisting none of those suggestions will work and why. You get frustrated, both of you get angry, and maybe stomp off or say some things that shouldn’t have been said. The person with the problem was playing the role of the Victim. They won’t accept help because one side of them, their Shadow, wants to stay powerless at the moment. When you offered your first suggestion, you wanted to be their Rescuer. When you became insistent on their taking one or another of your suggestions, you just became their Perpetrator. Why are you suddenly a Perpetrator? You were just trying to help! Because thinking that you know better about another person’s struggle puts them in a powerless position – keeping them a Victim. Rescuers need Victims to rescue, and Perpetrators need Victims to perpetrate upon. And Victims long for a Rescuer to rescue them, but if they are attached to staying powerless, they help create the Perpetrator dynamic so they are not responsible for staying a Victim. This dynamic is common in families that grew up with a lot of drama. If we came from a troubled background, chances are we unconsciously play out this Drama Triangle. We might take the Victim role because we are still looking for mom or dad to come and save us. The trouble with this dynamic is that everybody ends up being a Victim in the end. 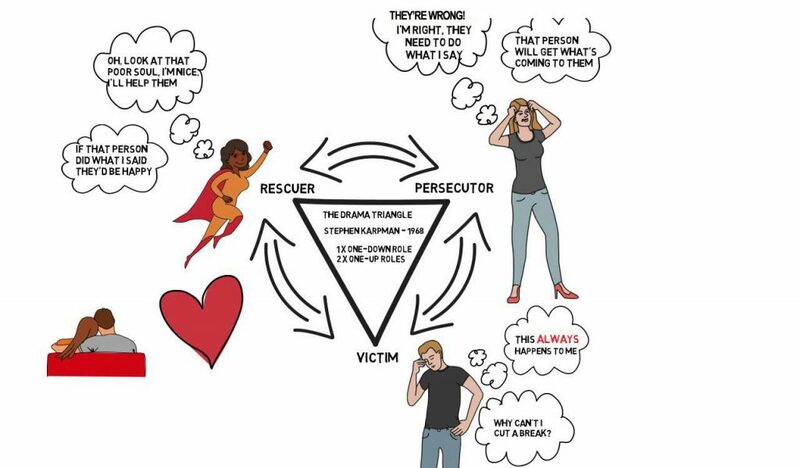 This is just one way the dynamic can play out, it can start in many different ways – a Rescuer can put someone into a Victim position and become their Perpetrator. A Perpetrator can also reverse roles and try to Rescue their Victim. How to get off the Drama Triangle? Don’t take the bait. If someone comes to you with their problem, lend them a sympathetic ear. To empower them, you can ask them if they have any ideas how they can solve their problem, and again hear them out. Be very careful not to offer advice or any suggestions. You can ask them if they’d like your advice or your point of view, and then give it if they would like your input. Notice within yourself if you are attached to them following through on your suggested solution. At this point, your input has been given, and you need to grant the other person the respect of having faith that they will know how to sort out what’s best for them. Let go and allow their Higher Power to guide them. If someone continually comes to you with their problems, or doesn’t seem to come up with their own solutions, they are attached to staying in the Victim role. The best thing you can do for them is to express confidence in their own ability and power to sort it out for themselves. If they’re not ready to take responsibility for their own empowerment, they will move on to the next Rescuer / Perpetrator they can create drama with, and you will be relieved of the burden of going through that kind of drama over and over again. Stay true to the boundaries you set! If you are the person who tends to take the Victim role, recognize that you are looking to give the power for your life and your decisions over to someone else. If you are ready to get off the Drama Triangle, build a stronger relationship with your Higher Power, and ask your Higher Self to help you come up with the best solutions for whatever challenges you may be facing. I’d love to hear from you in the comments below or on my Facebook post here – does this sound familiar? Have you run into this dynamic before? Do you recognize it in yourself? Did you succeed in stepping off the Drama Triangle? Do you have anything to add to the discussion? Great! Glad that it helped!